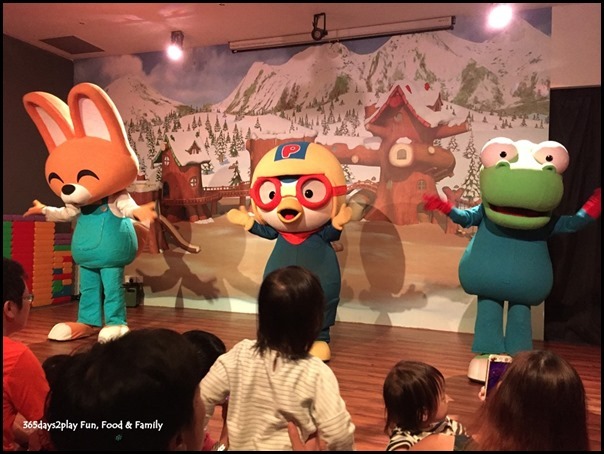 Pororo Park – 5 reasons why you should visit! 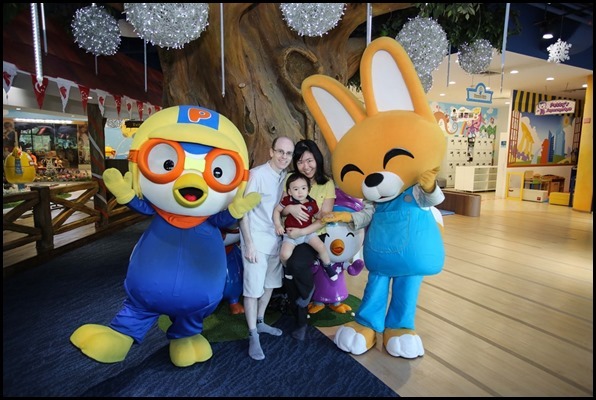 Whether you or your kids are fans of Pororo the little penguin from Korea or not, I would highly recommend a visit to Pororo Park the indoor playground located at Marina Square. What’s so special about this indoor playground you might ask. 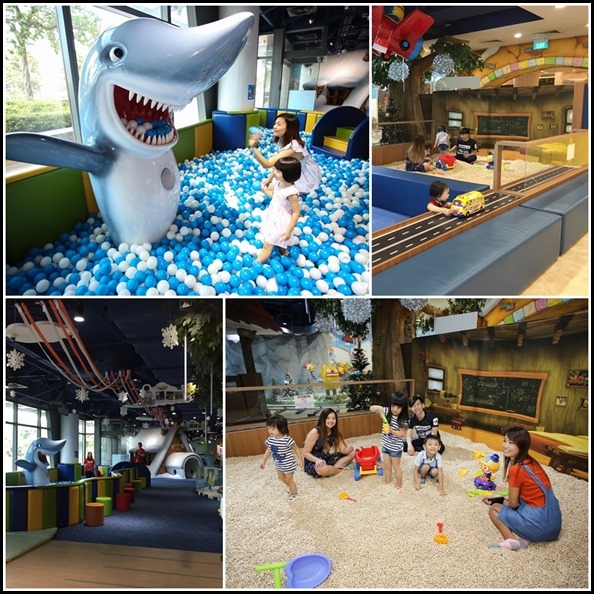 There are of course numerous indoor playgrounds dotted all over Singapore. 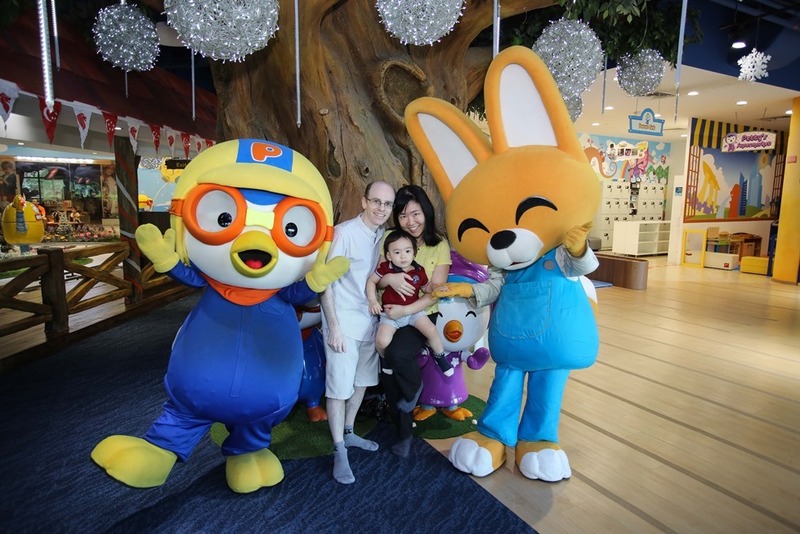 I’ve never watched a single Pororo programme, and prior to my 1st visit to Pororo Park with Edward, I too wondered what’s the big deal about this place. I’ll be frank, the admission fees are not cheap. They are probably one of the most expensive admission fees for an indoor playground in Singapore. A child ticket already costs $29.90, which in itself is already higher than average. 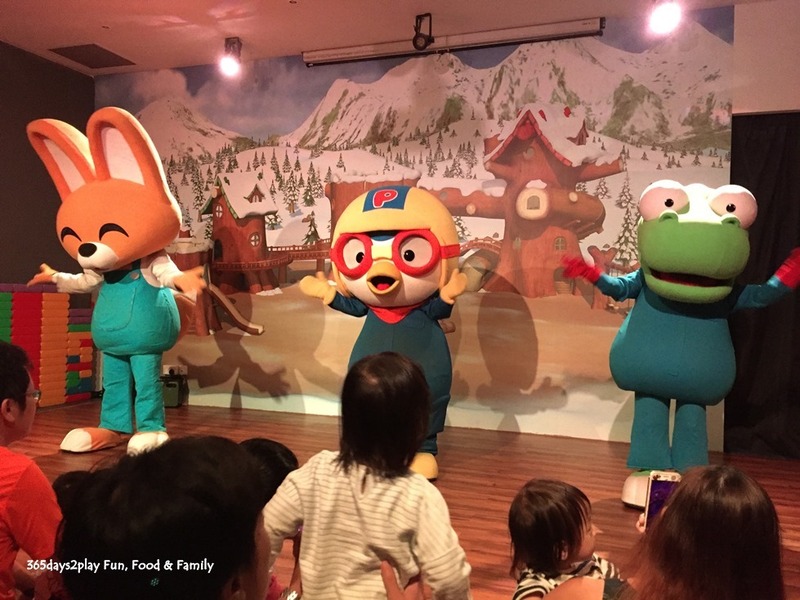 And unlike other indoor playgrounds which usually admit at least 1 if not 2 accompanying adults for free, each accompanying adult at Pororo Park has to pay $6. Not cheap, to say the least. But Pororo Park does offer more than the average indoor playground. It’s like a mini amusement park! The mascots and the live performances are the clincher for me in my opinion. Edward has never watched Pororo before, yet he was completely smitten by the mascots when they appeared. 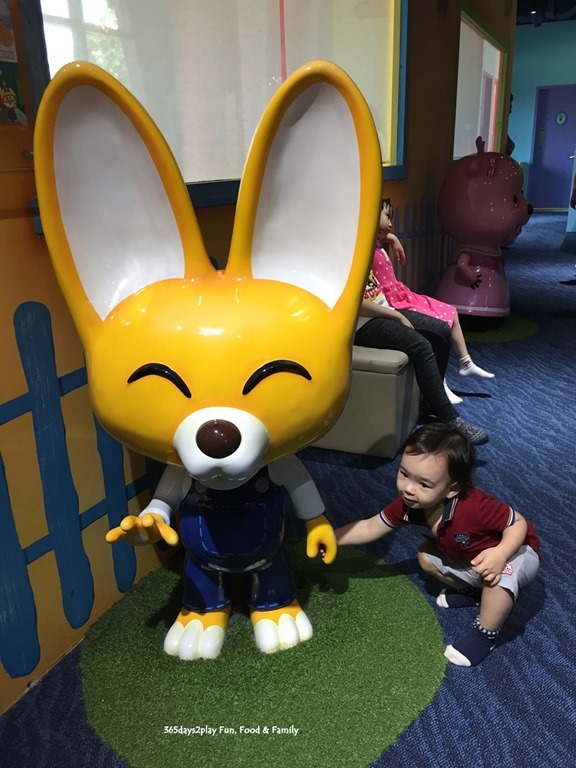 He shook hands with them, he hi-fived them, he clapped his hands during the performance and he even wanted to shake hands and sayang the statue of Eddy the fox! He kept talking about Pororo for days after the visit! Here’s a short clip of the live performance where the audience are seated up close and personal with the characters. You have to watch this video of Edward trying to hold hands and “sayanging” Eddy the fox. Did you see him trying to press his head towards Eddy? Edward doesn’t do kissing so that’s him dishing out top affection to Eddy! 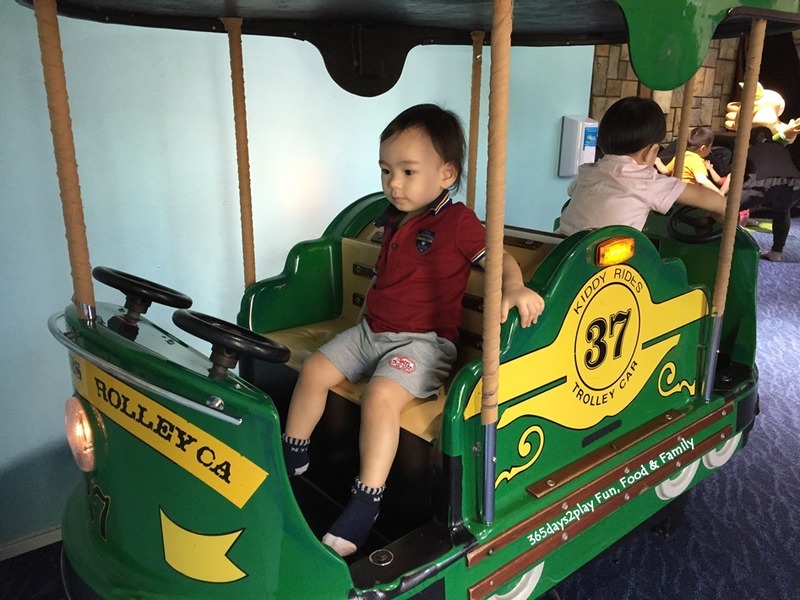 Aside from the live performances and the train ride, there is a big play gym, a huge ball pit, a mini-house, pretend-play supermarket and “sand-pit”. That’s quite a lot of stuff to explore. In fact, this is the first indoor playground where we spent more than 2 hours, and barely covered half the stuff. For other indoor playgrounds, I start to find myself getting bored around the 2 hr mark, and start wanting to watch the clock. 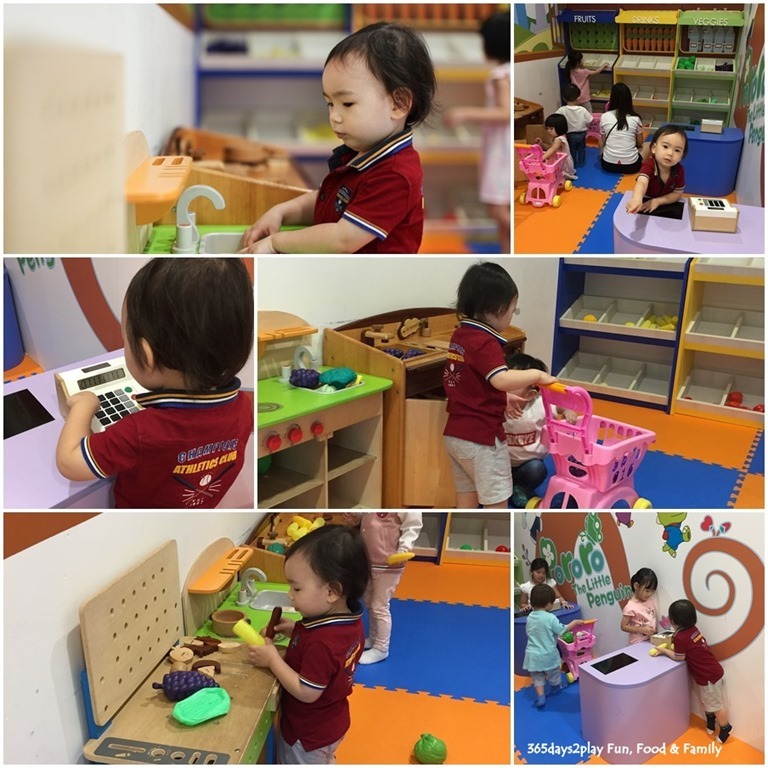 Excluding the play gym which can be get pretty rough and tumble, the rest of the indoor playground feels spacious and safe for toddlers. 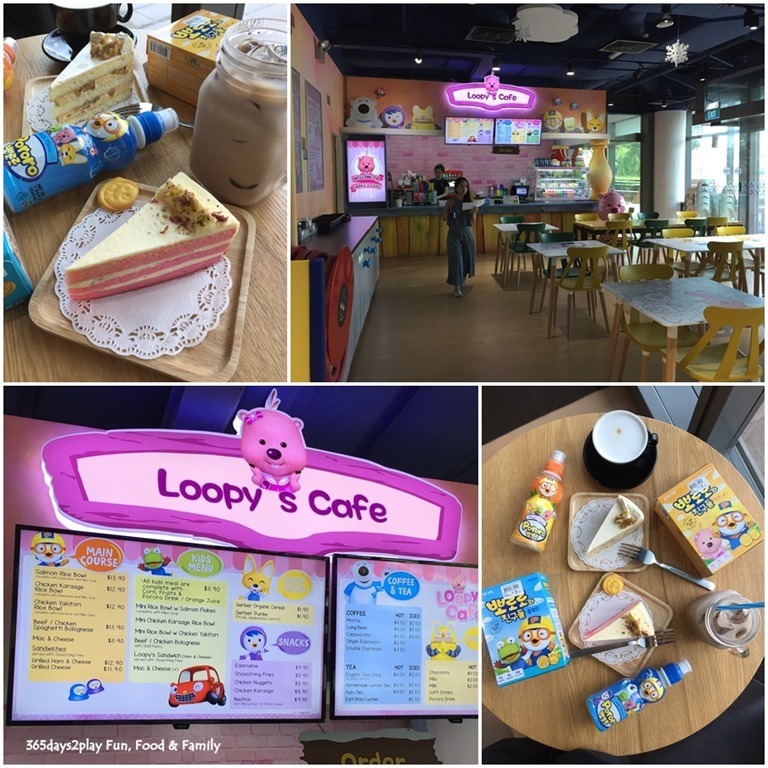 From the vantage point of Loopy’s Cafe, you can actually keep an eye on your child without too much trouble, instead of having to follow closely behind them all the time due to a bad layout. I know some people have a love-hate relationship with indoor playgrounds. The kids love it so much but the parents get flat out tired at the end of the session! Because this is a themed park, with characters and merchandise, just like how it is with the Disney brand, the visit will be a talking-point even after you leave the Park. It certainly was the case for Edward. 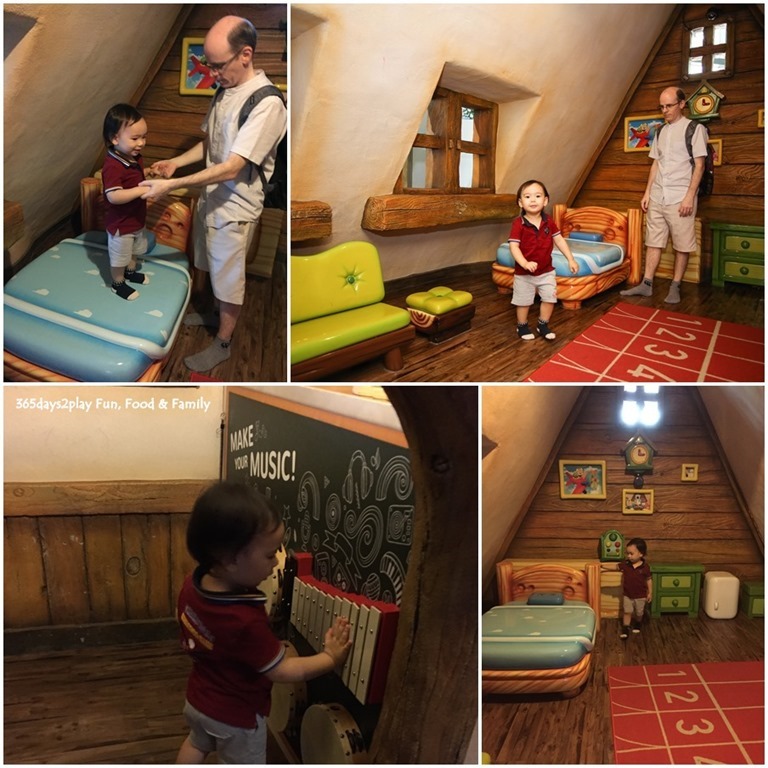 He kept mentioning that he wanted to return to Pororo Park or “I like Pororo”. It was nice to know that he enjoyed his visit so much to be talking about days later. Bonus reason! 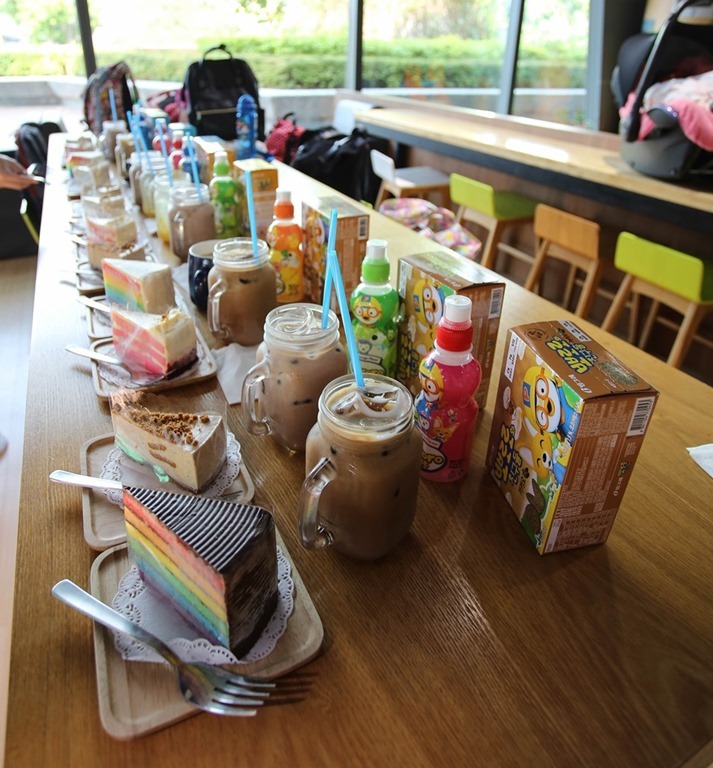 The cafe is not some afterthought to house the parents like it tends to be for some other indoor playgrounds. I found it to be bright and clean, and the cakes and drinks were enjoyable too. 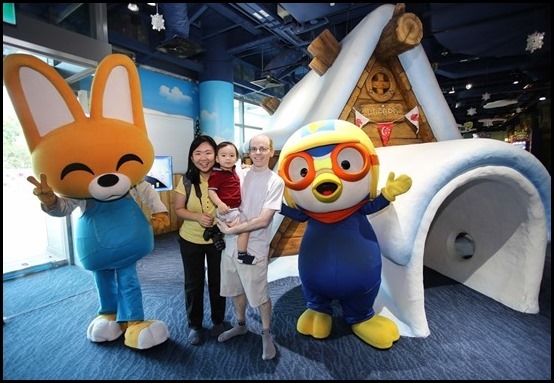 Scroll down to see more pictures of our wonderful visit to Pororo Park! Edward trying to hold hands with Eddy the fox! Edward always loves the supermarket section of any indoor playground. 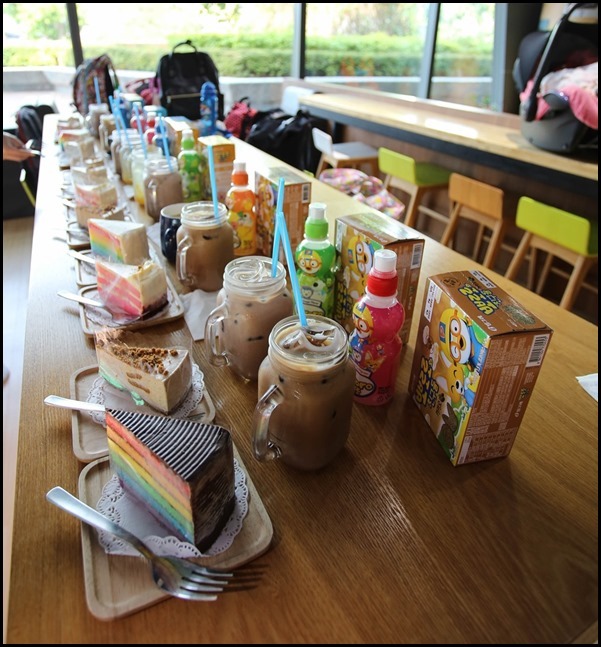 That’s where we spent about half our time at Pororo Park. Love the cute little miniature house! For once the kids feel like they’re the correct size! Trolley car ride. Another favourite of Edward’s because it reminded him of the trams in Melbourne which he adored. Add me on Facebook, Instagram and Twitter if you want to be kept up to date with the latest happenings in the food and lifestyle scene in Singapore! Or follow Edward on Instagram! 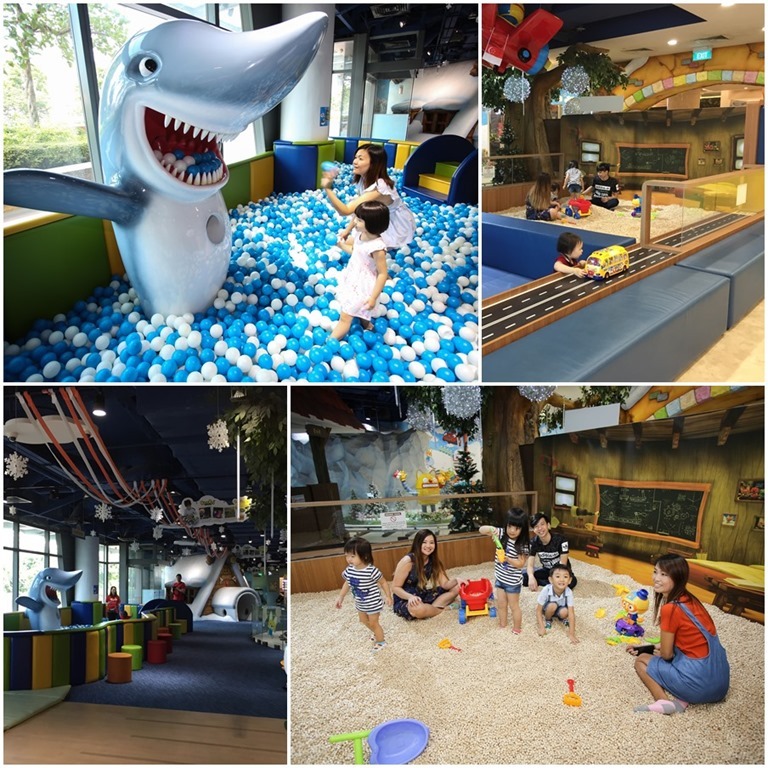 Check out other Indoor Playgrounds in Singapore.